Summary: These results displayed further “steady and sustainable” growth from the used-car loan firm. Although the seasoned executives remain optimistic about the group’s prospects and the wider economy, margins have dipped once again as the impairment charge representing potential bad loans continues to rise. Still, the 11-12x multiple appears modest given the company’s growth rate and there is a near-5% income, too. I continue to hold. A trading update last month had already hinted these first-half figures would be quite respectable. The H1 statement showed revenue up 33% and operating profit up 23%, and trumpeted the fact that SUS had already enjoyed 17 consecutive years of increasing profits from its Advantage motor-finance division. An 18th year of growth now looks very likely. Long-time boss Anthony Coombs said the overall performance showed “steady and sustainable growth, which investors should recognise as our trademark”. Mr Coombs also claimed the group’s “excellent and continuously improving standards of speed and customer service” had helped generate a further 12,542 car-loan agreements during the half. Emphasising that SUS is somewhat picky with its clientele, that 12,542 figure represents only 3% of the total 440,000 applicants. A prominent feature of March’s annual results was the impairment figure leaping 60%. My verdict at the time was that the favourable lending conditions of the preceding few years may now have turned — and I believe these results underline the growing prospect of greater bad loans. “Although a return, for competition reasons, to Advantage’s traditional customer mix has seen an increase in impairment to revenue, risk adjusted yield has been protected by good interest rates. Indeed, current levels of impairment are significantly below those experienced just five years ago following the financial crisis, when the business continued to increase profits and maintained very good returns on capital employed. Impairments ran beyond 30% of revenue during 2012 and the preceding years, so there is still some way to go before those levels are reached. This H1 statement made further references to personal contract plans (PCPs) used within the motor trade. Articles such as this have suggested PCPs are fuelling a credit ‘bubble’ in the car market. “Our relations with the regulatory authorities continue to be good. Whilst the Financial Conduct Authority expects to scope its report on the motor finance market by next year, we expect this to concentrate upon the recent significant expansion in the personal contract plan (PCP) market, in which Advantage has never been involved. There has been no major change to the general shape of SUS’s accounts. The higher impairment charge meant SUS’s operating margin dropped to 41% from 44% during 2017. Although a 41% margin remains very high compared to that of most other businesses, a high level of profit is required to generate an acceptable return on the equity that supports the business. However, the 16% return was assisted by the use of significant debt — net borrowings increased from £49m to £81m during the six months — and adjusting my sums for the loans and associated interest reduces the result to a modest 12%. Net customer receivables (customer loans) now stand at £227m, from which I estimate SUS can produce near-term revenue of £81m. 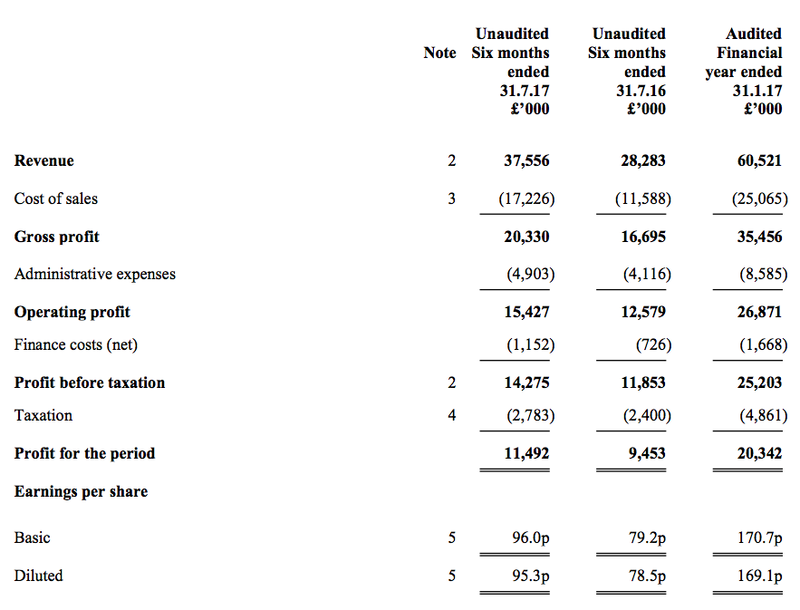 Assuming the impairment provision stays at 23% of revenue, and other costs remain at about 35%, I arrive at a potential £34m operating profit. Taxed at SUS’s expected 19.5% tax rate, I calculate possible operating earnings to be almost £28m or 230p per share. Adding net debt of £81m to the £240m market cap (at 2,000p per share) gives an enterprise value (EV) of £321m, or 2,673p per share. The possible P/E based on my EV and earnings guess is therefore 2,673p/230 = 11.6. That rating seems quite modest given SUS’s recent growth rate. I can only assume the stock market is worried about a combination of higher impairments, PCPs and wider economic issues. Meanwhile, the interim dividend was raised 4p to 28p per share, and the rolling 95p per share payout presently delivers a useful 4.8% income. Advantage Finance, our specialist motor finance provider based in Grimsby continues its excellent progress. Despite recent downgraded forecasts for the UK economy, Advantage applications for finance have been very good. This has enabled Advantage both to maintain this year’s rate of transactions growth and to revise, refine and further strengthen its under-writing model. Whilst the above underwriting refinements have seen a slight reduction in loan approvals, appropriate in a more uncertain economic climate, the introduction of Advantage’s new e-signature Dealfo system has been well received by both customers and brokers and has led to an improvement in the approval-transaction rate. Aspen’s growing reputation for efficient, consistent and prompt service to the broking community, augers well for a successful trial period concluding in H2 2018. “Whatever the current political uncertainty, particularly over Brexit, and despite a forecast slowing economy, demand for S&U’s products remains very robust. Our selective lending and continuous refinement of our under-writing underpin our debt quality and produce steady sustainable growth. There’s not enough information here to rework my valuations sums, but I do see the bad-debt provision is now 23.4%. My Blog post above noted the figure for H2 2017 was 22.4% and for H1 2018 was 22.9%. So the ratio is still creeping higher, although the business is taking on more customers so total profit ought to be moving higher as well. S&U plc, the motor finance and property bridging lender, today issues a trading update for the period from its trading statement of 7 December 2017 to the Group’s year-end on 31 January 2018. Group trading remains strong and in line with expectations; demand for Advantage’s motor finance has seen a record 24,500 transactions in the year, defying recent reports of a slowing car market. Aspen Bridging has lent over £10m and early repayments are in line with expectations. S&U’s final results will be announced on 27 March 2018. Whilst this has led to improvements in initial customer quality scores, Advantage’s new industry leading Dealflo system, fully rolled out in the period, has led to a significant improvement in transaction-to-approval rates. We expect this in turn to lead to further growth in high quality business, margin improvement and a gradual reversal in the recent, and historically small, uptick in impairment-to-revenue. Furthermore, early signs are that the recent fall in new car sales is likely to buttress used car values, whilst the economic advantages of diesel vehicles remain widely appreciated in Advantage’s non-prime sector of the market. From 1 February 2018 and for our accounts for the forthcoming year ending 31 January 2019, IFRS9 “Financial Instruments” replaces IAS 39 for the way we value and measure our financial assets. In particular, IFRS9 requires the impairment of our customer receivables to be recognised through an expected loss model rather than IAS 39’s emphasis on historical impairment triggers. Good progress has been made on the new methodology and its effect on our accounting policies and receivable values. For illustration, the estimated impact of IFRS9 would have been a reduction of reported receivables by between 0.5% and 2.5% as at January 2017. As this is an accounting adjustment, there is no impact on either the Group’s cash flows or on the underlying profitability of its loans. A healthy market and our confidence in lending quality has seen combined investment in Advantage and Aspen this year reach a record £53m. As a result, Group borrowings are now at £105m and, although this rate of investment is expected to slow next year, we expect further funding facilities to be concluded shortly which will bring total committed facilities to £135m. This will provide sensible headroom for growth whilst maintaining gearing at S&U’s historically conservative levels. The Group’s profit performance and prospects have led the Board to approve a second interim dividend this year of 32p per ordinary share (2016: 28p). This will be payable on 16 March 2018 to shareholders on the share register on 23 February 2018. This means that our first two dividends this year, including the 28p per share paid in November, will total 60p against 52p a year ago, 43p in 2016 and 36p three years ago. These measures are consistent with our aim of returning to twice covered dividends in the near future. Customer and transaction numbers gained 20%-plus during the year. The slightly stronger H1 was also reflected during the previous 2017 financial year, so I don’t feel there’s any H2 deterioration to worry about. Debt was £49m at the start of the financial year, and advanced £32m during H1 and £24m during H2 to £105m. Although additional borrowings are necessary to fund the loans to new customers, I am pleased H2 did not demand as much extra debt as H1. Regarding extra debt, I am not sure whether the phrase “this rate of investment is expected to slow next year” alludes to customer growth slowing, or simply the business not needing as much extra debt to maintain the present rate of additional customers. During 2017, S & U received c750,000 applications of which c240,000 were provisionally approved and c20,000 transacted. So I think I am right in saying the transaction-to-approval rate was 20/240 = 8.3%. Anyway, I am pleased the new system will apparently lead to a “gradual reversal” of the unfavourable impairment trend seen of late (see my Blog post above). The dividend news now means the trailing payout is running at 99p per share, up 16% on the 85p per share seen this time last year. I will update my valuation figures when the full-year results are published in March.